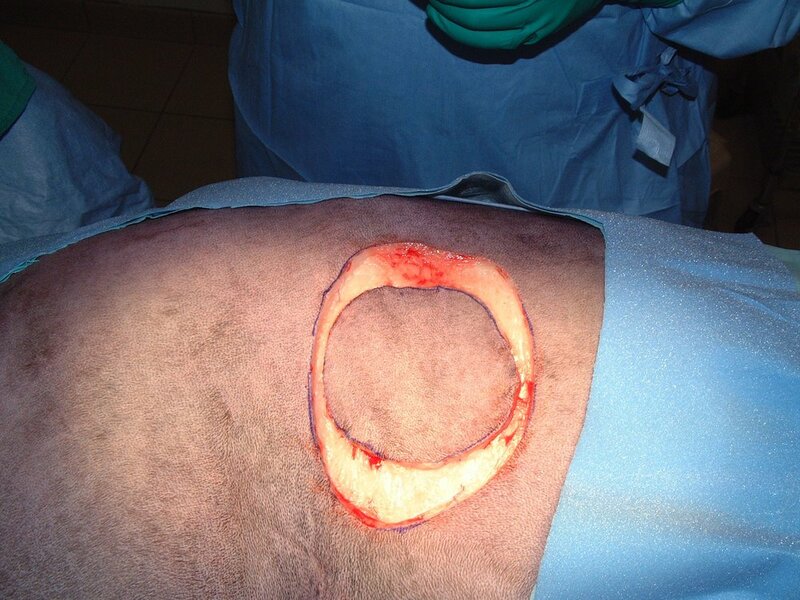 The major indication for a free-meshed skin graft is reconstruction of wounds below the level of the mid-to-distal antebrachium and tibia where other reconstruction options are often not available. 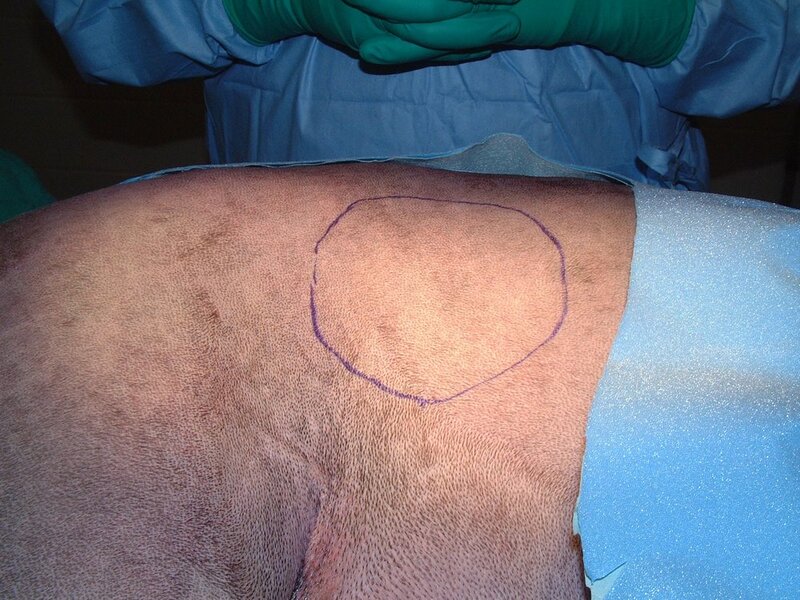 Free-meshed skin grafts can be applied either immediately following tumor excision or once a healthy granulation tissue bed is established at the tumor excision site. 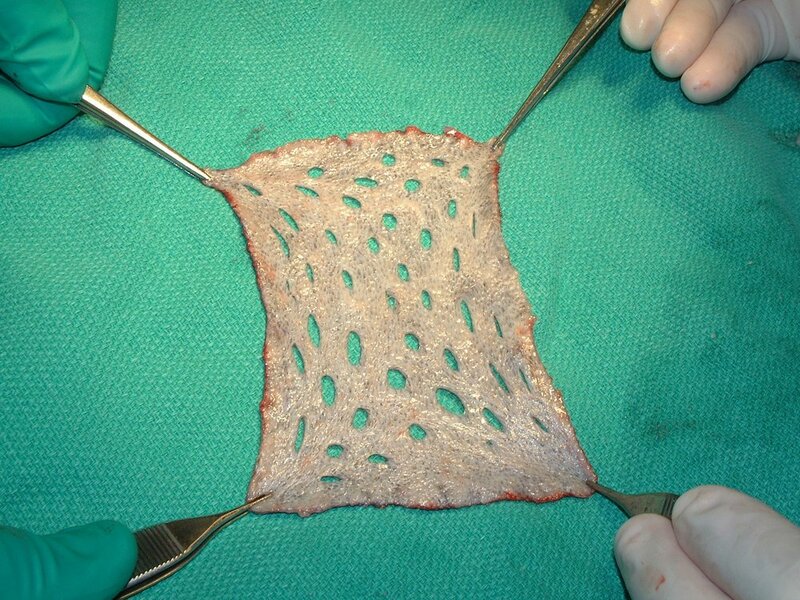 The success of free-meshed skin grafts depends on adherence, plasmatic imbibition, inosculation, and ingrowth of new vessels, and these can be tenuous and prone to failure. Adherence is when fibrin adheres the graft to the wound bed and pulls the graft closer to the wound bed and then conversion of fibrin to fibrous tissue results in adherence of the graft to the wound bed. This process starts at 8 hours post-grafting and continues to day 10. Plasmatic imbibition is the absorption of nutrients from the wound bed into dilated vessels of the graft to provide the graft with nutrition. This process peaks at 48-72 hours post-grafting. Inosculation is the anastomosis of the graft and wound bed vessels of similar diameter. This process begins 2-3 days after grafting and continues to day 6. The ingrowth of new blood vessels from the wound bed into the graft occurs at a rate of 0.5mm/day. 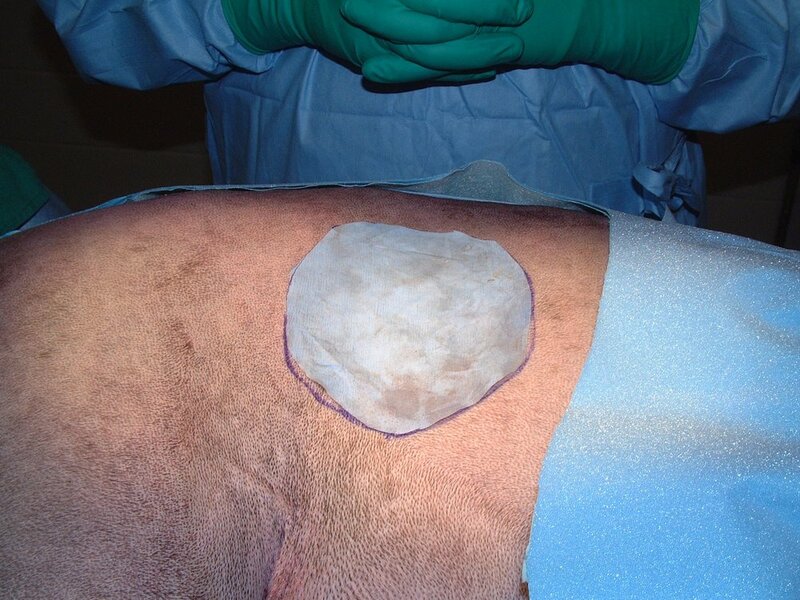 A free-meshed skin graft will fail if a seroma or hematoma accumulates between the graft and the wound bed or the graft is subject to movement prior to adherence because these will prevent adherence, plasmatic imbibition, and revascularization of the graft. In a 1991 clinical study, delayed free-meshed skin grafting was used to reconstruct distal limb wounds in seven dogs and all grafts had 100% survival. 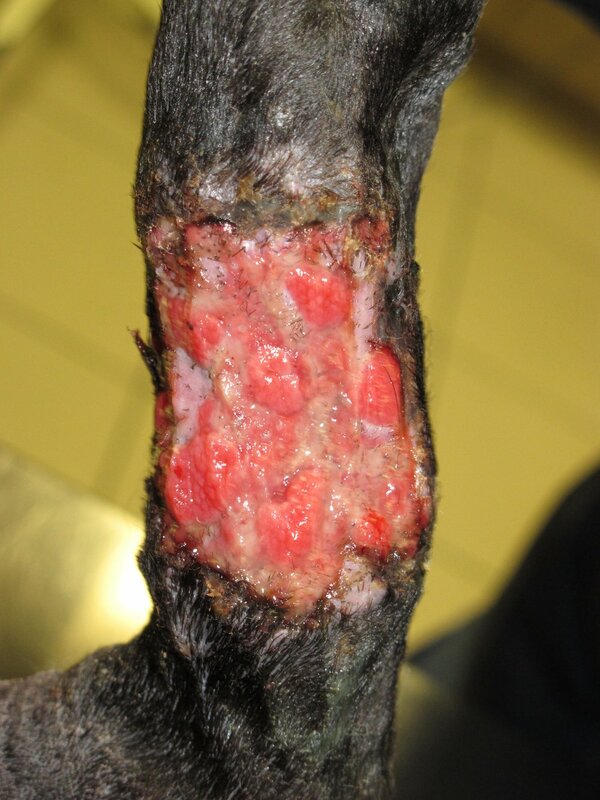 In a 2012 clinical study, immediate grafting was performed following resection of tumors of the antebrachium (six dogs) and hock (one dog) with 100% survival in three grafts and partial superficial necrosis in four grafts. In a 1999 study, free-meshed skin grafts were used to reconstruct 17 wounds in 16 cats and all grafts had 100% survival. Negative pressure (or vacuum-assisted) wound (VAC) therapy has been proposed as a technique to improve survival of free-meshed skin grafts. In a 2013 experimental study using VAC therapy for 7 days post-grafting, histologic results were better for free-meshed skin grafts treated with VAC therapy. In a 2015 clinical study of six cats with 10 wounds treated with free-meshed skin grafts and VAC therapy for 3-14 days post-grafting, seven grafts had 100% survival, two grafts had 95% survival, and one graft had 80% survival for a mean survival of 97%. 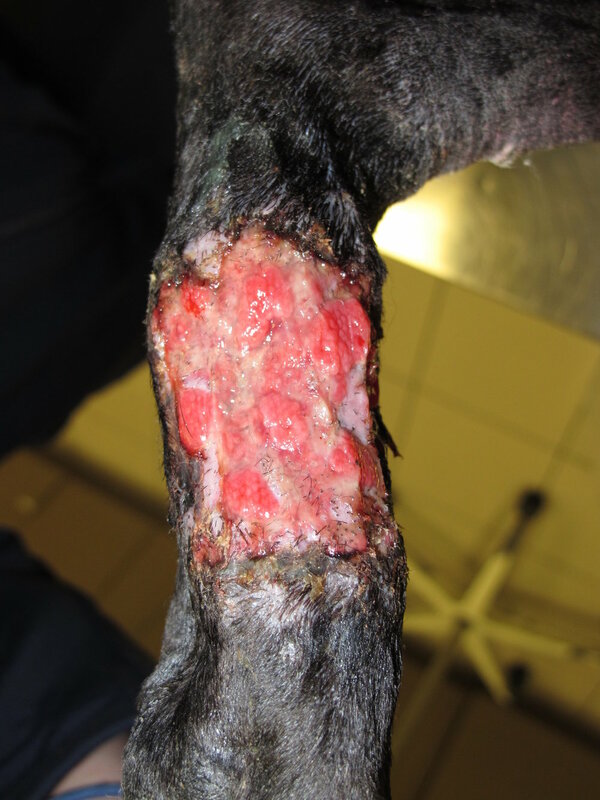 In a 2016 clinical study of seven dogs treated with VAC therapy for 4-7 days following free-meshed skin grafting of the distal limbs, there was 100% graft survival in all dogs.